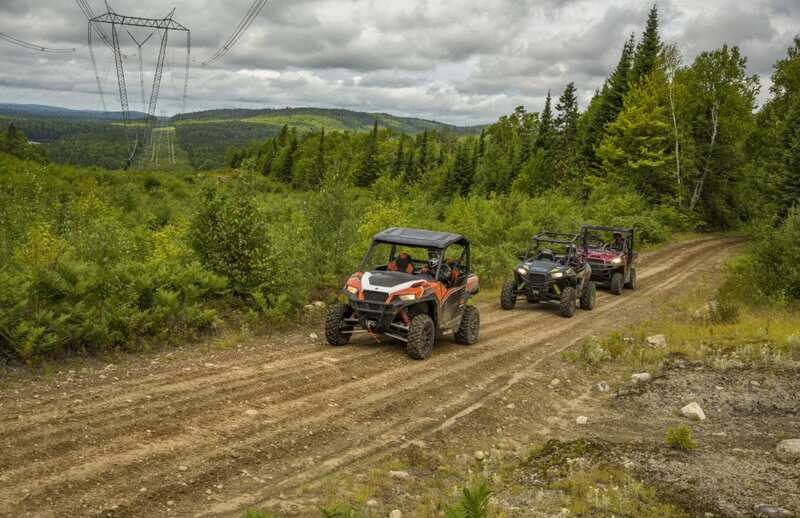 Every year we plan many expeditions in the upper-laurentian area of Québec, as we simply enjoy exploring and riding in this area. This area is not only appreciated by trail-riders, but also by outdoorsmen, as the hunting and fishing in this region is renowned across the country. This area also hosts the “Summun Trail System”, which offers 475 Kilometers (296 miles) of magnificent trails to discover. What makes this trail system unique is that it serves as a gateway connecting several regional outfitters. The “Summun Trail” system was created in 2010 with the combined efforts of the following outfitters: Notawissi, Mekoos and Fer a Cheval. For more information on the “Summum Trail”, please visit: www.sentiersummum.com. At Camp RZR Brimstone, I had the pleasure to meet Lindsey Hayes, which is one of the hosts of Destination Polaris. During our brief encounter I proposed the idea to Lindsay of filming an episode of Destination Polaris in this area. After several months of logistics and planning, that idea would soon become reality. Never heard of Destination Polaris? Really? Well, Destination Polaris is entering its 7th season on The Fox Sports Networks. 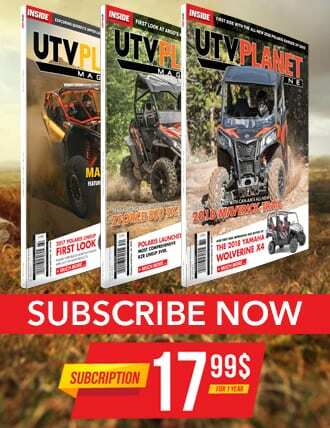 Destination Polaris (produced by Ron Schara Productions) is the #1 Off-Road TV Show in North America. 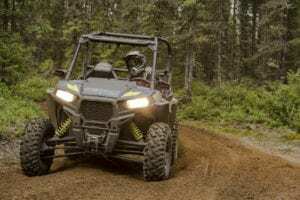 Available in over 100 million homes in the US and Canada, Destination Polaris is the premiere show to catch up on all the best riding spots, off-road racing and custom builds. 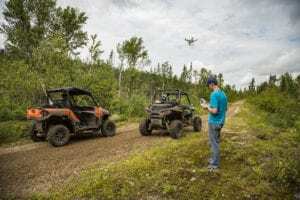 From sand dunes to mountain peaks, from canyon rides to mud pits, Destination Polaris is your authority for all terrain travel. Our adventure begins roadside on the 117 North Road, were we meet up with Lindsey Hayes and her team of photographers/editors: Gram Krause and Cole O’Brien. After a brief “formal” introduction session, we setout to our first destination: Mekoos outfitters. We pulled into Mekoos outfitters in early evening and got the Destination Polaris team settled into their accommodations. Mekoos outfitters are located approximately 3 hours north of Montreal and Ottawa. 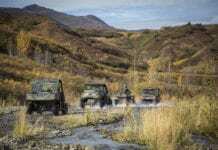 The last 27 kilometers (16.8 miles) consist of unpaved road, however the road is so well maintained that it can easily be navigated, even by car. The outfitter sits on 346 square kilometers (215 square miles) of exclusive territory and hosts 135 lakes. The Mekoos is an exceptional location for families and trail riders wanting to vacation in this remote backcountry setting. The Mekoos is an exceptional location for families and trail riders wanting to vacation in this remote backcountry setting. The Mekoos is primarily an outfitter, so it does offer different plans and rates for fishing and hunting packages. The rates depend on the activity you will be doing, number of persons and duration of stay, for complete rates we encourage you to visit the Mekoos website: www.mekoos.ca. 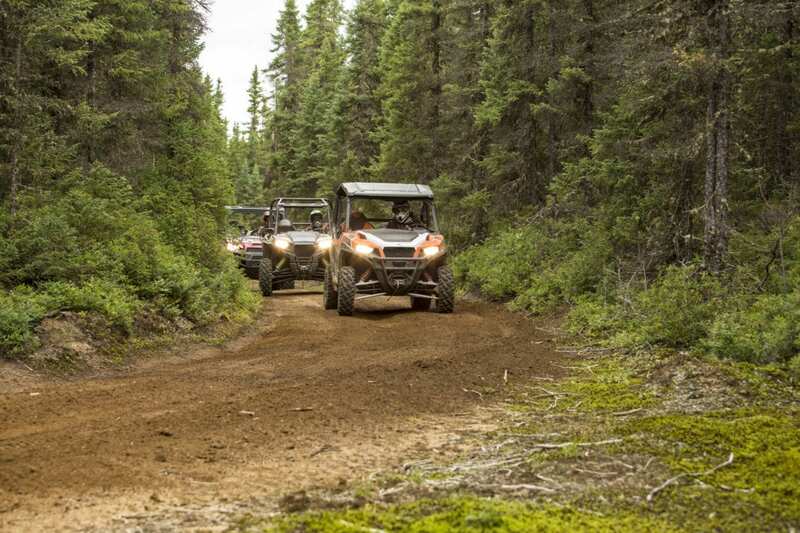 Once the Destination Polaris team got settled in, we meet up for a round of refreshments and started planning our first day or riding and activities. Planning the logistics for “Day 1” couldn’t have been easier, as Eric Mervicini our sales Manager and I had already scouted out the area for several points of interest. After a great dinning and socializing experience in the tranquil settings of the Mekoos dinning room, it was time to call it a night. It was obvious that our friends from Destination Polaris were consumed by the long day of travel they just experienced. We awoke well-rested and to cloudy skies, hoping that Mother Nature would be co-operative today. After a most satisfying breakfast we started packing the units for our daylong adventure. We left Mekoos and after a quick ride made our way to “Rat Lake” where we would try our hand at speckled trout fishing. On the trails for our daylong adventure. 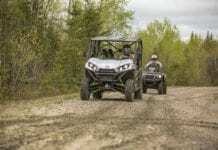 Once we caught a few nice speckled trout and the Destination Polaris photographers captured the scenes they needed for the show, we hit the trails once again. The rest of the morning was spent capturing more riding footage, which ultimately led us to our lunch destination. We rode to “Baker Lake”, a magnificent lake with a sandy beachfront and that place would be our lunch area for today. As we arrived, Sebastien Dumoulin, owner of Mekoos Outfitters and his team were busy preparing a wonderful shore lunch for us. Fresh Trout and Walleye were on the menu along with some great side dishes. Not a bad way to spend a few hours amongst friends. 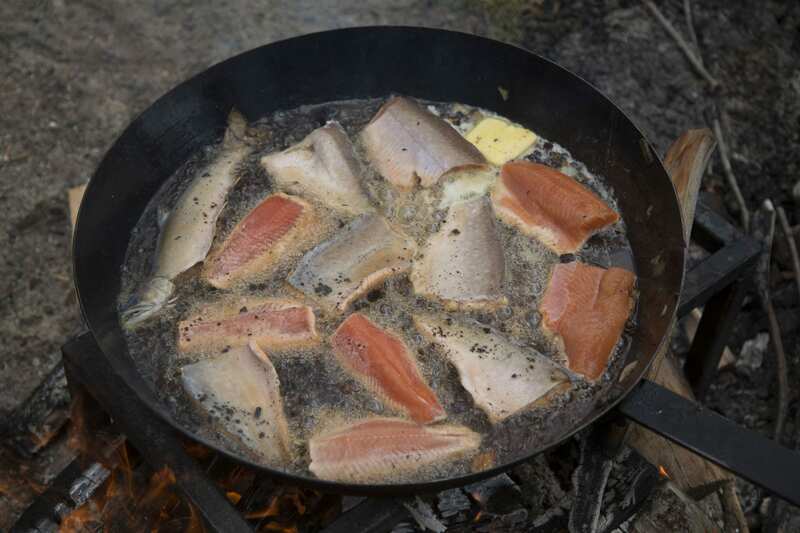 Fresh Trout and Walleye were on the menu along with some great side dishes. After a plentiful and most satisfying meal, we hit the trails once more. We took the Destination Polaris team up a nearby mountain which hosted a fire lookout tower for this area. The Destination Polaris photographers were able to capture some great vistas from this location. We soon found ourselves back on the trails and the rest of the day was spent riding with frequent stops to capture more footage. Feeling content from a great first day, we found ourselves once again sitting around the table enjoying more great food in the Mekoos dinning room. After too much food, we spent the remainder of the night exchanging in pleasant conversation around bonfire with our friends from Mekoos and Destination Polaris. We woke once again to cloudy skies and still wondering if Mother Nature would play nice with us today. Today was the day we said goodbye to Mekoos and made our way to our next outfitter: “Les 100 Lacs”. We hit the “Summon Trail” for our 88 kilometers (55 Mile) journey to “Les 100 Lacs Outfitters”. After breakfast and thanking the whole team at Mekoos outfitters for their gracious hospitality and excellent service and accommodations, we hit the “Summon Trail” for our 88 kilometers (55 Mile) journey to “Les 100 Lacs Outfitters”. As you are reading this, I am sure some of you must be thinking: “He is calling an 88 kilometers (55 miles) ride a journey?” The scouting ride Eric and I did took us about 1.5 hours to reach our destination. When we did the same ride with the Destination Polaris team, it took almost 8 hours to reach our destination “Les 100 Lacs” Outfitters! When filming for the television show, the guys behind the scene (cameraman) have a huge responsibility in not only capturing ample footage but also the best footage possible. This involves frequent stops, setting up their gear (camera, tripods & drones) and making sure that the shots captured represent the experience we are living at that moment. This is a long and repetitive process for them but I must say that after watching Gram Krause and Cole O’Brien work, these guys are exceptional at what they do! Gram Krause – Doing his thing. Cole O’Brien – Behind the lens. After many hours on the trail, everything was going great until we heard a loud yell coming from the unit behind us and so we stopped to investigate. 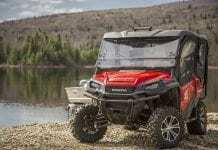 Sure enough, the Polaris RZR S 1000 punctured a tire! We were well equipped to repair a puncture but not on the sidewall! Since the units were all loaners, we had no spare tires on hand. We tried to repair the tire with plugs, but as we all know, a tear in the sidewall is not repairable with plugs. With still 40 Kilometers (25 Miles) to go and Mother Nature starting to get temperamental, we had no choice but to make the hard call. We had to get the unit to our destination on the punctured tire even if that meant damaging the rim and possibly worse! Eric left the group and made his way to “Les 100 Lacs” Outfitters while we continued shooting. At this point Mother Nature decided she had been nice enough with us long enough and the rain began. Gram and Cole quickly packed up the gear protecting it from the rain and we all squeezed the go-fast pedals on units until our destination. Upon our arrival at “Les 100 Lacs Outfitters”, we were rejoiced to see that Eric made it and that no additional damage was done to the unit. He also made arrangements with a local dealer in the Mont-Laurier area to have a tire and rim shipped to us. A huge thank-you to: Stephane Venne from “Moto Des Ruisseaux” for coming to our assistance with such immediate response time. Personally this is what I love about the “Summun Trail System”. The trails offer great riding for any level of rider and are clearly indicated; so getting lost is almost impossible. Plus if a mishap of any kind were to occur, help is never that far away. All outfitters along the “Summun Trail” offer assistance and fuel to any and all trail riders. Now that our unfortunate mishap was under control, we introduce the Destination Polaris team to the owners of “Les 100 Lacs” Paul Ouimet and Alain Lamoureux. They quickly got us settled into our accommodations. “Les 100 Lacs” offers a vast variety of activities for the whole family, an ideal location for your next family vacation or riding adventure. After a much needed shower, we regrouped in the dining area, which overlooks the lake. The rustic feel of the dining area and Inn was the perfect setting to unwind after a long and grueling day on the trails. Once again the food was exceptional and the hospitality from the staff was equally on par. The rest of the night was spent joking about our misfortunes that day and boasting that we still managed to get a good days work in nonetheless. The next morning we awoke to more sun than cloud and were eager to tackle the trails once again. Our short overnight stay at “Les 100 Lacs” Outfitters had now come to an end. After thanking all the staff at “Les 100 Lacs” for the more than gracious welcome and hospitality, it was now time to set-out to our next and final destination: “Fer A Cheval” Outfitters. We hit the “Summon Trail” for our 63 kilometers (40 Mile) ride to “Fer A Cheval” Outfitters. Today’s ride, although not that much shorter in distance, would be travelled at a much faster pace. The Destination Polaris team still captured ample footage, but since we had no mishaps, we reached our destination by late afternoon. Gram capturing some aerial footage. Gram shooting slow motion sequence. 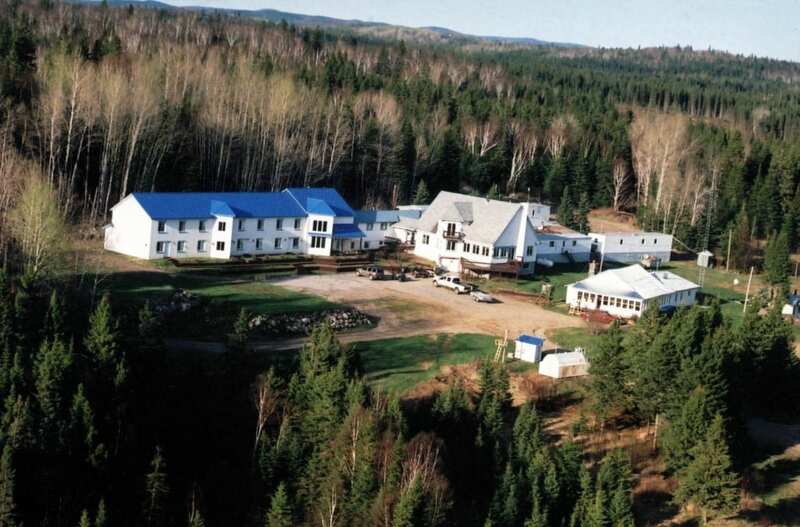 The “Fer à Cheval Inn & Outfitting Resort” is located just 2.5 hours north of Mont-Laurier, Quebec and is situated on an exclusive territory spreading over 238 square kilometers. 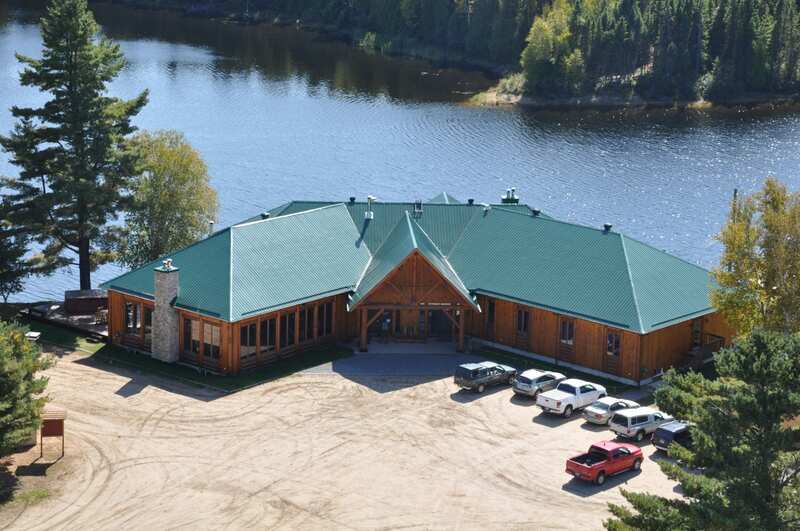 Besides its 4 star inn, the outfitter also offers cabins surrounding the main lodge and rustic camps on the outskirts of various water bodies for the more adventurous. 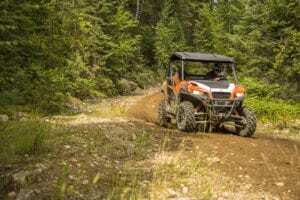 The outfitter offers many packages to choose from hunting, fishing, Quad and snowmobiling. For more information on “Fer à Cheval” outfitters, we invite you to visit: www.feracheval.ca. 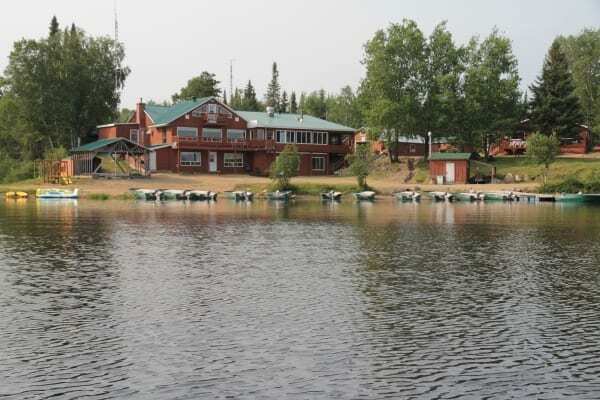 Besides its 4 star inn, the outfitter also offers cabins surrounding the main lodge and rustic camps on the outskirts of various water bodies for the more adventurous. We pulled into “Fer A Cheval” outfitters around 4pm and were greeted by the general manager Benoit Gladu, which quickly had us settled into our accommodations. Our early arrival gave us time to unwind and check out some of the aerial footage capture by Gram that day. We regrouped for supper around 7pm and Ben, who is also the Chef at “Fer à Cheval” outfitter, served us an exceptional meal. Later that night, while we were enjoying some after dinner refreshments, Francois Thouin, owner of the outfitter, arrived and we planned the next day’s activities. Immediately following breakfast, we hit the trails once more, as Gram and Cole wanted to capture more trail riding footage. We rode to some scenic locations close to the outfitter and were out on the trails until Gram and Cole felt they had the footage they required. After our lunch break and again way too much food, we decided to take Lindsey out for some more fishing. Lindsey is an avid hunter and angler, so now she would try her hand at Northern Pike and Walleye. Cole shooting Lindsey – fishing for Northern Pike and Walleye. So our guide Jean Philippe Larocque loaded up the pontoon and we set out for an afternoon of fishing. Eric and I were the first catch walleye, nothing to write home about, but some nice catches just the same. Lindsey being an avid angler was eagerly waiting her turn jigging on the bow of the pontoon. Then BAM! Fish on for Lindsey! As she was reeling in her catch, you could tell it was something big by the fight that was ongoing. When she netted the fish, the screams of joy commenced, what a monster, a 29-inch Walleye! Still, even as I write this, I don’t know what was more impressive: the Walleye or her reaction! Lindsey’s reaction was the highlight of this trip for me; I sincerely hope it makes it into the episode. Lindsey and “Wally” – The Monster 29-inch Walleye. That evening was spent admiring and shooting the sunset off the pontoon before returning to shore for, you guess it, more exceptional food! During our meal many stories were shared about our adventure. However Lindsey’s Walleye “Wally” or should I say her reaction over “Wally” was definitely the chart topper. Did I mention that Lindsey is an avid angler? Oh yeah I did! But just to prove my point, let me share this with you. The next morning while we were all getting our beauty sleep, she was out back on the water with Jean Philippe. She didn’t land another monster, but she did catch a few she could boast about over breakfast. All good things must come to an end and this is no different. After bidding our goodbyes to the entire staff of “Fer A Cheval” outfitters and thanking them for an unforgettable stay, we loaded up our gear on our trucks and hit the long gravel road, which returned us to reality. We would like to thank the entire team of Destination Polaris: Lindsay, Gram and Cole. Thank-you for believing in our episode proposal and for the kind hospitality you have shown towards our team. Proud to now consider you as friends and look forward to working with you again real soon. We would like to thank the entire team of Destination Polaris: Lindsay, Gram and Cole. 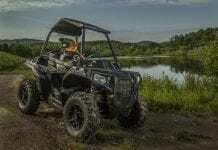 A big thank-you to Polaris Industries for the loaners (Polaris General 1000 DLX and Polaris RZR S 1000. A very special thank-you to all the outfitters involved (Mekoos, 100 Lacs and Fer A Cheval), without you this would have been impossible to accomplish. Thank you for the warm welcome, hospitality and taking care of us during our stay. Readers, if you are planning to ride or vacation in this area, make sure to check out these awesome outfitters. Stephane Venne from “Moto Des Ruisseaux” for your prompt actions for our replacement tire and rim. Lastly, I would like to thank our Sales Manager Eric Mervicini, for all the help in planning the logistics of this expedition.